Brian Boyle is the Head of Infrastructure with HEAnet, where he directs rollout of network infrastructure and services for the third level education and research community. The portfolio of services has everything from Data Centre hosting, Managed Applications, worldwide WiFi roaming, a multi-platform video collaboration network and more. 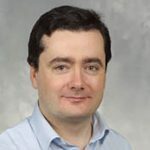 Before joining HEAnet, Brian worked as an IP Network Operations Manager in Eircom.net and IT services developer in Motorola. HEAnet is Ireland’s National Education and Research Network (NREN), providing innovative services to institutions involved in education in Ireland. Advancements in network infrastructure in recent years have allowed NRENs like HEAnet to provide services over wide area networks which were previously only practical through direct local networks. As we all come to rely on networked (or cloud) based resources for day to day activities, this education network infrastructure has become vital for many aspects of campus life, with HEAnet’s services meshed very closely with campus services. This presentation seeks to explore the long-term significance of this collective move towards a cloud-based e-Infrastructural future.